The Croatian wineries have many national and international activities offered and organized by the Wine Association in Croatian Chamber of Economy (CCE) with regional partners. The recognition and turnover of Croatian vines shall be successful only through a consistent representation at all major national and international promotional events, fairs and gatherings. 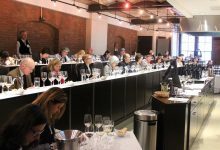 Croatian Chamber of Economy through the Wine Association organizes presentation of Croatian wines called “VINA CROATIA -vina mosaica” in New York. The presentation will be held on Monday, 26 March 2018 in Astor center in Manhattan, beginning at 11:00 and ending at 16:30. In addition to the presentation of wines from the winemakers themselves, there will also be two wine tasting (Masterclasses). Wine tasting will be led by American sommelier Cliff Rames and Dr. Mathew Horkey & Charline Tan, American wine experts who are very familiar with Croatian wines..
ProWein 2018, March 18. – 20. At this years “Prowein 2018” there are more then 6.700 exhibitors from 61 countries and approx 300 growing regions from throughout of the world that are featured here. Some 500 evetns – including numerous guided tasting sessions, seminars and presentations will be held directly at exhibitors stands and at the two Prowein Forums.